Be ready to celebrate the season with this gourmet gift basket, featuring a wonderful assortment of snacks, including fruit, meat, cheese, and crackers perfect for picnics and lunches in the park. 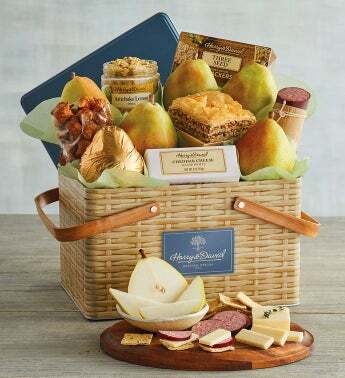 In addition to our remarkably juicy Royal Verano® Pears, we're offering a range of picnic delights, like white cheddar cheese, Thuringer summer sausage, peanut butter pretzels, and more. Packaged in an exclusively designed picnic-ready tin, this gift is ready to help you make any occasion a special one.